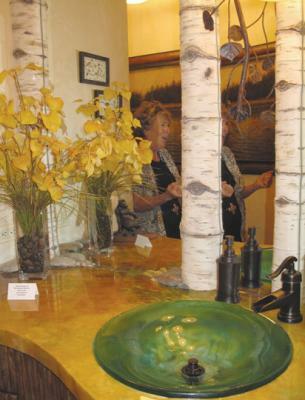 To solve a client's bathroom dilemma, interior designer Irene Nelson called upon local craftspeople, including glass artist Greg Grasso, countertop master Steve Cobb, ceramic specialsist Julie Anderson and painter Sigi Malinovski. Photograph by Deborah Olsen. Steamboat Springs, CO - WHAT SURPRISES VETERAN interior designer Irene Nelson is that people don’t recognize the wealth of talent available in the area of home décor and artistry that exists right here in the Yampa Valley. The project began with the basin. Irene designed a circular, light blue glass sink to double as water for a fishpond scene. “I originally made a glass sink that had wavy edges, but that wasn’t the look they were going for,” says artist Greg Grasso. “So I made another one that was straightforward and simpler.” Greg, owner of Grasso Glass & Stone, has called Steamboat home for more than a decade. Working a plethora of ski-town jobs before finally making it as a glass and stone specialist, he feels incredibly fortunate for his successful artist’s life in the valley. Whenever Irene has previously manipulated segments of a mirror to hang on a rounded wall, she’s known that the seams need custom tiles to fulfill the desired look. The same holds true with this project, where aspen-tree tiles allowed her to use tall, skinny mirror pieces. Enter another local artisan.